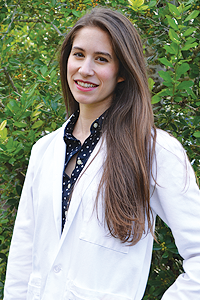 Dr. Erbesti was born in Baton Rouge, Louisiana and moved to Richmond, Virginia when she was in high school. Dr. Erbesti particularly enjoys aesthetic and surgical dentistry and is excited to continue her career here in Jacksonville. One of her favorite parts of being a dentist is getting to know new patients! She is dedicated to giving her patients a beautiful smile while focusing on patient comfort and education. Alexandra Erbesti attended Louisiana State University for her undergraduate studies and spent a year in France teaching English. She then attended Virginia Commonwealth University School of Dentistry where she received her Doctor of Dental Surgery degree. After graduation, Dr. Erbesti elected to complete an Advanced Education in General Practice residency at University of Alabama at Birmingham Hospital. There she received advanced training in complex and aesthetic dentistry, implants and sedation. She also worked closely with the oral oncology department and received advanced experience with medically complex patients. Dr. Erbesti is an active member of the American Dental Association, the Florida Dental Association, and Academy of General Dentistry. Dr. Erbesti is a dedicated attendee of continuing education courses enabling her to provide patients with the best in conservative and cutting edge dental care. Dr. Erbesti and her husband, Camden, reside in the Riverside area of Jacksonville with their two dogs. When she is not treating patients, she spends her time volunteering with the Junior League, trying new recipes, and traveling when she has the opportunity.